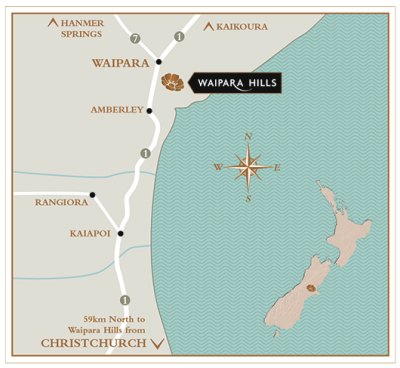 With the greatest number of varieties of all the regions, Waipara often has the most prolonged harvest. The first fruit picked in Waipara was the same block as last year with the hand harvesting of some Clone 95 chardonnay for the Equinox range on the 28th of March. This region also enjoyed the fantastic summer conditions which stretched along the entire East coast of New Zealand. Sauvignon Blanc developed some great flavours, with ripe nectarine and stone fruit characters predominating. It’s different from the typical Marlborough Sauvignon Blanc flavour spectrum, but delicious all the same. The other highlight was the first harvest of fruit which had been grown using organic methods. Separate parcels of Pinot Noir, Pinot Gris, Sauvignon Blanc and Riesling were grown without the use of synthetic herbicides or fungicides in a trial to see the resulting quality of fruit produced. This will be continued for the next two years as a learning experience for both vineyard and winery staff. The fruit this first year looked very exciting on the vine and I am looking forward to seeing the resulting wines at grading. Waipara as a region seems to love growing great Pinot Gris and Riesling. The fruit develops lovely ripe fruit flavours without necessarily accumulating too much sugar which produces wines of intensity and finesse without excessive alcohol content. I fully expect that 2013 will produce Pinot Gris that will match some of the best examples of 2011. For the record, harvest started on the 28th of March and was completed with the final Pinot Gris harvested on the 1st of May.